30 X 12 Stamped Steel Baseboard Return - White Discounts Apply ! These baseboard vent covers feature a durable white enamel finish. These quality return air grates are manufactured with galvanized steel to minimize rust. Baseboard vent covers have fin spacing of 1/3" with a 20 degree angle. These return air grates are great for use in residential and commercial use. Your baseboard vent covers will arrive with installation screws. Return air grates are a quality product for a fair price. ***Hint: The industry standard is to order baseboard vent covers using the actual hole opening size and not the faceplate size. 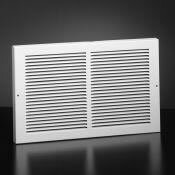 This metal return air grille will fit a 30 x 12 inch hole opening. Baseboard vent covers can be found in multiple sizes and finishes. Return air grates are necessary for a proper air system, but old, dented vents are an eyesore. Get new, bright whites today!